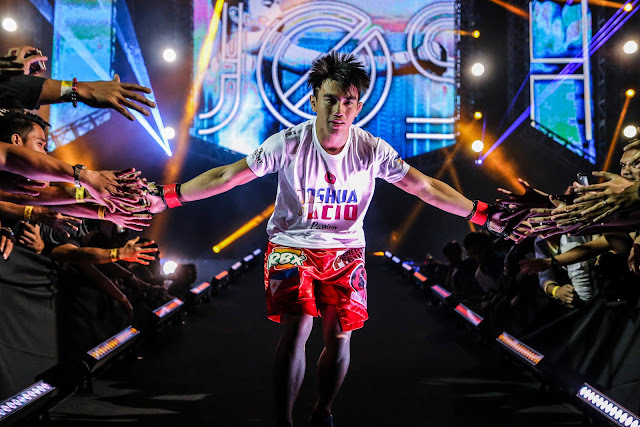 At 22 years of age, Joshua “The Passion” Pacio of Baguio City, Philippines has already accomplished much inside the ONE Championship cage in a short span of time. Since making his promotional debut in 2016, Pacio has been on an incredible run. In just his third appearance in the ONE cage, Pacio already earned himself a shot at the ONE Strawweight World Championship, held by reigning titleholder Yoshitaka Naito. Although “The Passion” fell just short of victory in his first world title opportunity, the next generation Team Lakay proponent soldiered on and to this day continues to improve with every bout. Pacio returns to action at ONE: REIGN OF KINGS, set for 27 July at the Mall of Asia Arena in Manila, Philippines. He takes on unbeaten Thai warrior Pongsiri “The Smiling Assassin” Mitsatit in what should be an epic clash of rising stars. Surrounded by world champions, the martial arts prodigy is fueled by inspiration emanating from his Team Lakay teammates who have reached the pinnacle of the sport. “I am inspired and amazed with the things going on around me,” said Pacio. It’s been just two years since Pacio fought for a world title, and the memory has been emblazoned on his mind since. The feeling of coming so close to strawweight supremacy is both painful and fleeting. Everything the young Filipino is doing now, he says, is so he could get back to that level. At the very least, Pacio feels he is steadily improving his skills so that when ONE Championship does give him the call he’s been waiting for, he will be ready. “It’s up to ONE Championship when I will fight for the title again, but I will happily take my time developing my skills correctly,” said Pacio. But despite Pacio deciding to wait patiently for his next world title opportunity, there is no denying the ramifications should he win his next bout. Against Thailand’s Mitsatit, an opponent with a perfect 9-0 record, Pacio faces a rising star whose career is also on an upward trajectory. The two men match up very well on paper, with Pacio’s wushu striking pedigree going up against Mitsatit’s powerful Muay Thai. Fans are certainly expecting an all-action, high-octane striking battle between the two. “This bout, as is any, is honestly very important to me,” said Pacio. A victory for Pacio could certainly bring him an inch closer to a rematch he craves with reigning ONE Strawweight World Champion Yoshitaka Naito. Which is why “The Passion” is laser focused on bringing home the victory at ONE: REIGN OF KINGS. Whether or not he is close to getting his wish for another crack at gold however, the 22-year-old is at the very least eager to prove that he belongs in the discussion. “For me, there is nothing better than martial arts,” Pacio concluded.